1947 League For Friendly Service TB Charity Seals, full gum, F, MNH. Issued 1947 by the League for Friendly Service, Bloomfield, NJ. Green's Catalog 2-822, multicolored setenant pair. 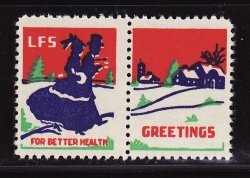 1947 League For Friendly Service TB Charity Seals, F, MNH. Issued 1947 by the League for Friendly Service, Bloomfield, NJ. Greens Catalog #2-822, multicolored, fully perfed setenant pair, full gum. 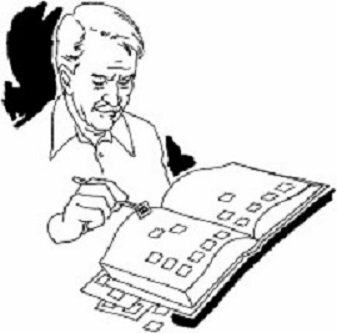 Seals are 17x23 mm, perf. 121/2. Image of man and woman walking. Figures and houses are in blue, background in red, trees in green. 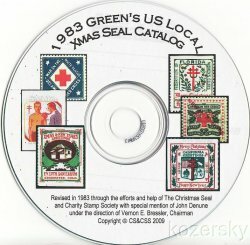 Text at bottom of seals "For Better Health" and "Greetings"
TB Charity Seals are also known as Christmas Seals, and are classified as Charity Seals or Cinderella Stamps.